Edward Augustine Hore | Launceston Then! 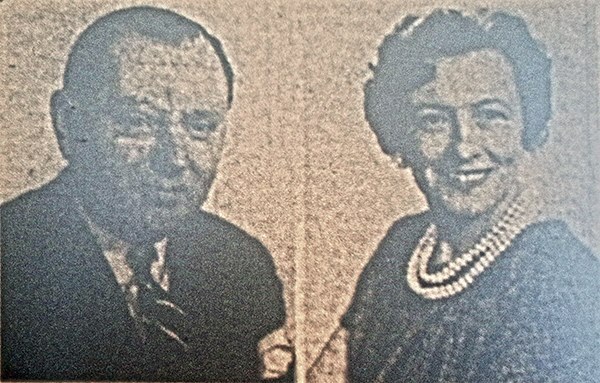 Mr. and Mrs. E. A. Hore in 1962. Edward Augustine Hore was born in 1917 at Devonport, Plymouth. His mothers maiden name was Hockings. On leaving school he trained as an accountant working for a city firm. At the onset of the Second World War he volunteered for the R.A.F. spending a total of 6 1/2 years in service. Much of that time was spent in the Middle East and it was here that he sustained serious injury in a motorcycle accident. He married Edith Leah Bloor, herself a member of the Women’s Royal Air Force for 4 1/2 years, at Emmanuel Church, Plymouth on April 30th 1945. They had one daughter, Louise, born in 1948 (it was Louise that had the honour of presenting a bouquet to the Queen during her 1956 visit to Launceston). On being demobbed, Edward returned to his accountancy job and for a short time lectured at the Plymouth Technical College before moving to Launceston in 1950 becoming a partner in a firm of chartered accountants. He and his family set up home in Dunheved Road. Edward was fist elected to the Town Council unopposed in May, 1956, but was defeated in the following years election. A year later he stood again and this time was returned at the top of the poll, an achievement which he repeated in the election of May, 1961. In May, 1962, he was selected to be that years mayor. Before the war, Edward played cricket with the Plymouth Bohemians Club, and hockey with St. Andrew’s Church Sports Club (Plymouth) and Devon Barbarians. On moving to Launceston he was soon involved with Launceston Cricket Club becoming president. He was also vice-president of a number of other local organisations including the Rugby Club, the Minors Football Club and the British Legion. Edith herself was also a member of the British Legion as well as the Mother’s Union and Women’s Institute. He died on April 26th, 1969, aged just 52. He was interred after a service at St. Mary Magdalene Church at the Launceston Cemetery.